# To compliment this site and all the online computer tutorials on offer I have setup a computer help forum where you can go to ask your questions. Can you imagine what you would do if you turned your PC on went in to My Computer and you were a drive letter missing. Well it is possible you could just reboot your PC and hey presto it would be there. You would no longer have a problem right? Well what would you do if when you rebooted your PC and it still was not there? You could try this. Before we start I would like to show you a screenprint of "My Computer" showing only 2 drives thats my "C" drive & my "D" drive the one that is hidden is my "H" drive. Take a look yourself. Its not there right! well I can assure you it does exist I have simply hidden it. So lets see where it has gone. Left click "Manage" This will open up a window called "Computer Management" like you can see in the screenprint below. Now click on "Disk Managent" which is located near the bottom of the list on the left hand side. 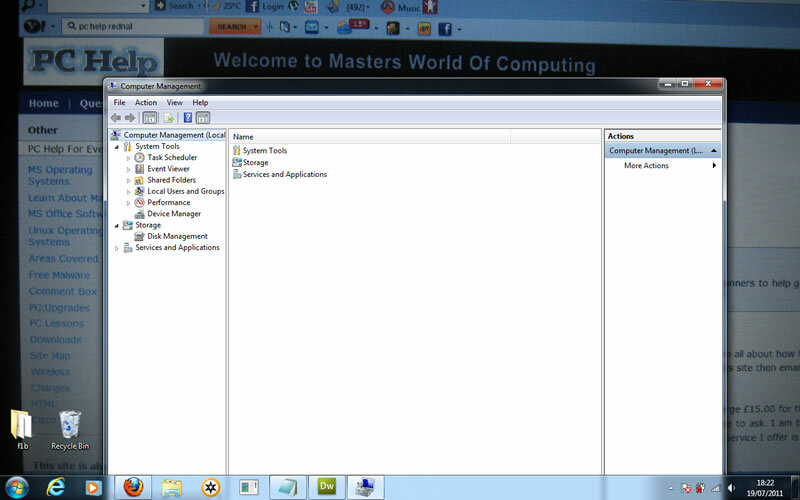 When you click on Disk Management you will see the window change to look like the screenprint below. 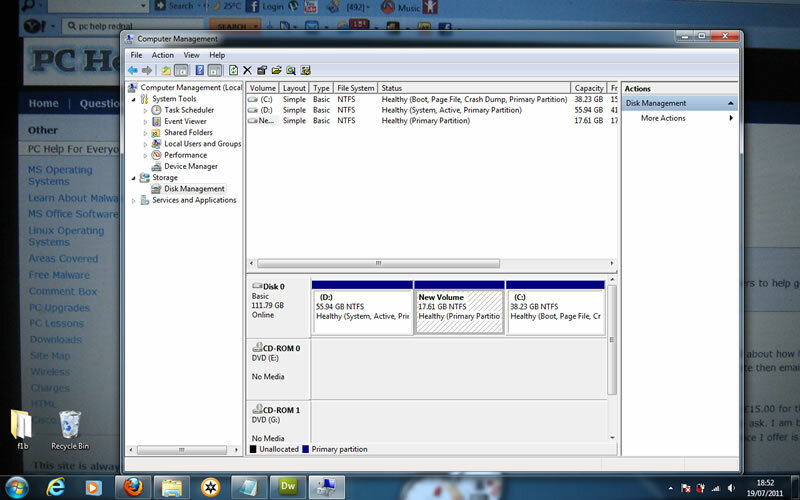 ie it will show you all partitions on your hard drive. Your partitions will be different to mine, everyone's is different the screenprint is so you get the jist of things :) The partition that I hid was called the "H" drive look at my screenprint above and you will see 3 partitions. 2 of them are labelled, one is called "D" the other is called "C" The one in the middle Simply says "New Volume" this will be our "H" drive. 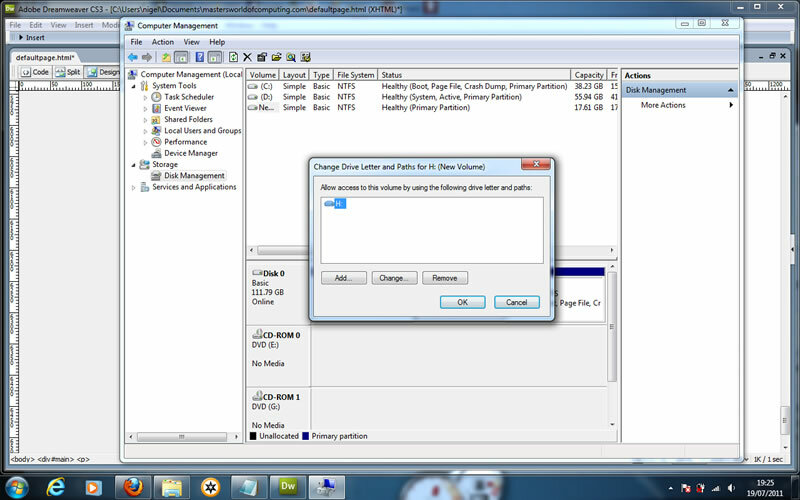 To unhide the partition do this. Right click on it and left click "Change drive letter and paths" like I have done in the screenprint below. You will then get a popup window like I am showing you below. 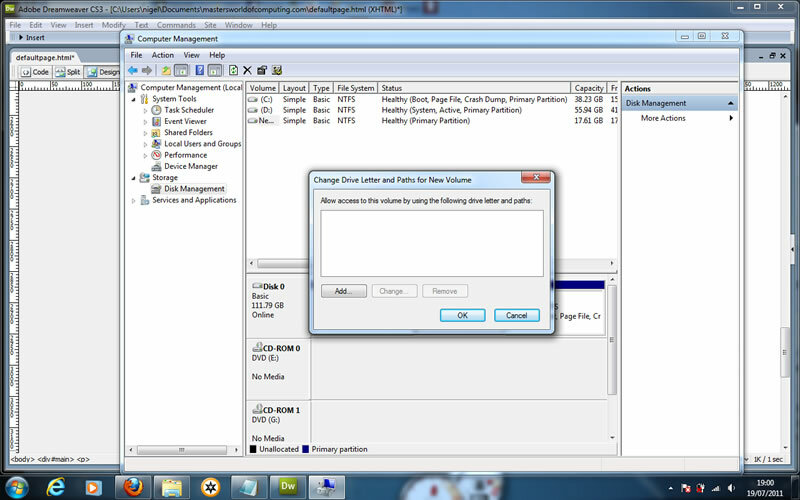 The window says "Allow access to this drive by using the following drive letter and paths" You need to click on "Add"
When you click on "Add" you will see another popup window like I am showing you below. This window says "Add drive letter or path"
For this tutorial you need to click on "OK" because you can see it automatically chose a drive letter for us "H" (This was our hidden partition remember) You will also note that there is a check mark in the box labelled "Assign the folowing drive letter" so like I said just click "OK"
When you click "OK" that window will close and you will see only the "Computer Management" window open. If you now look at it you will see it is showing all 3 drives with drive letters assigned to them. Look at my screenprint below. Now what I want you to do is go to "My Computer" and take a look, below I am showing you a screenprint of "My Computer" you will see it is now showing all 3 drives hey presto we did it. 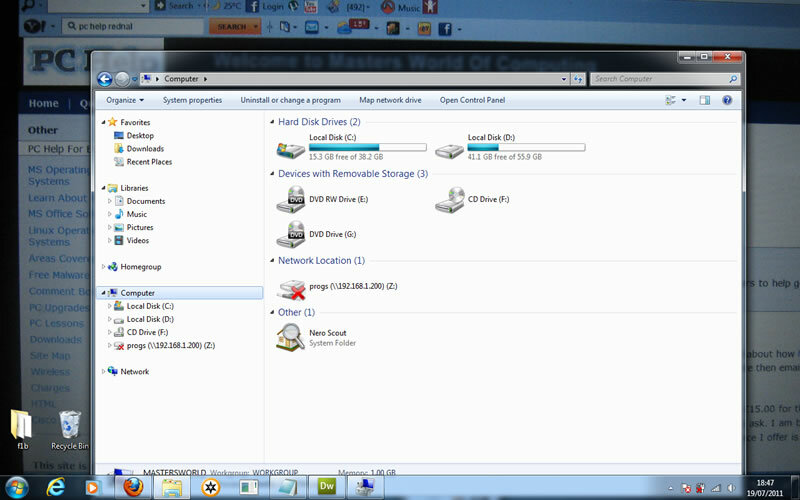 I will now give you a quick how to on hiding a drive which is basically a reverse precedure of what we have done. 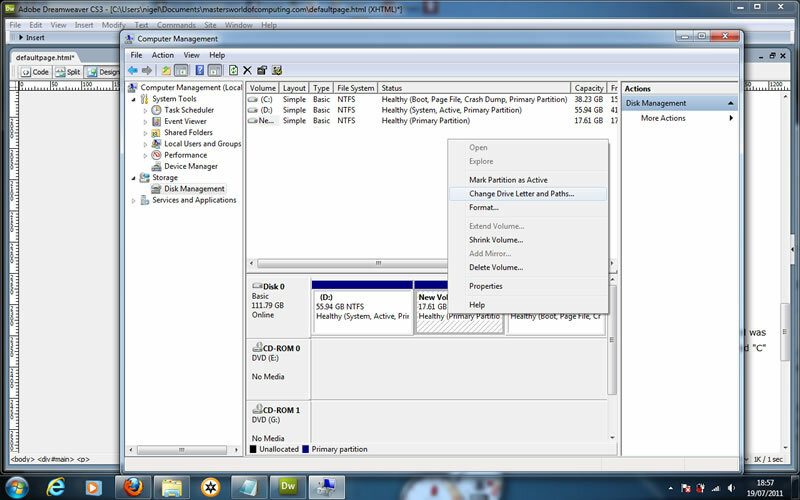 For this lesson we will hide drive letter "H"
Open up "Computer Management" window by clicking on "start" then right click on "My Computer" and left click "Manage"
this will open a window like mine below. Now right click on drive "H" and you will see a popup window appear like mine below. Left click on "Change Drive Letter and Paths"
You will now get another popup window appear like mine below. You need to click "Remove"
When you click remove you will get another popup window like mine below. 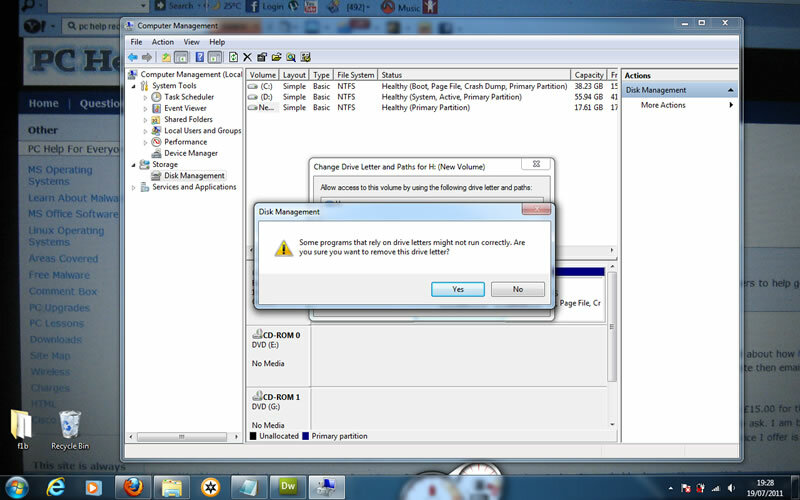 The message is telling you "Some programs that rely on drive letters might not run correctly. Are you sure you want to remove this drive letter" You need to click "Yes"
So now go to "My Computer" and check if you can see the drive ( I bet you can't) because we have hidden it. Look at my screenprint below of "My Computer"
If you are still with me at this point that is all, I hope you have got the information you were looking for. Why not take a look at my other Windows 7 tutorials found here.